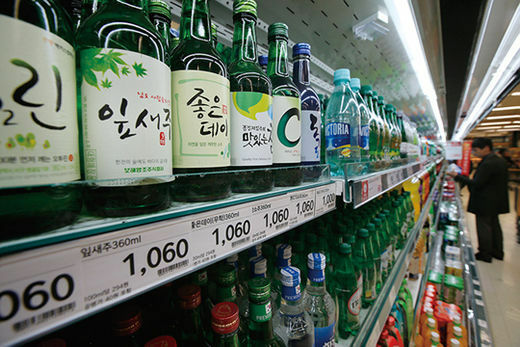 Nearly 67 percent of South Koreans in their 30s have experience drinking above World Health Organization’s recommended level of alcohol consumption, the highest tally among other age groups here, according to a survey conducted by the Ministry of Food and Drug Safety. For women, the average daily alcohol consumption was 4.7 shots for soju and 4.1 glasses for beer, which were all above the WHO’s recommended consumption level, which is 2.9 shots and 2.8. glasses respectively. The average for men was below the recommended level of less than 8.8 shots of common Korean distillied liquor soju, data shows. Thursday’s result came after the ministry conducted a survey on 2,000 people aged 15 and above between Oct. 20 and Nov. 6, who consumed alcohol at least once. More than half of those who said they consumed alcohol within the last six months responded that they had at least one shot of boilermaker. Called poktanju in Korea, boilermaker, a combination of beer and liquor, was the most popular alcoholic drink among those in their 20s and 30s, with 55.7 percent of the former and 54.5 percent of the latter responding they have had one recently. The average alcohol consumption per day among the respondents marked 6.1 shots (50 milliliters each) for soju, 4.8 glasses (200 ml) for beer and 2.9 glasses (200 ml)of rice wine. The tally was 4.5 shots (30 ml) for whiskey.